Beading Arts: New product from ImpressArt! 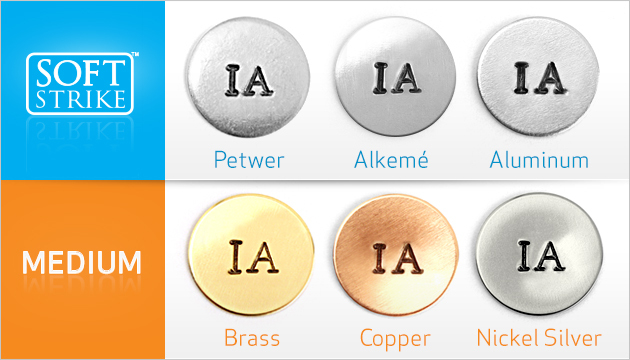 Alkeme is the new metal stamping alloy that sits between pewter and aluminum in hardness, as you can see in the chart below. Softer and easier to get good impressions than with copper or brass, it has the look of silver, but no where near the price! It is a tin-based alloy, free of lead, nickel, and cadmium, those nasty elements that many folks are allergic to, and that are also just plain unhealthy. 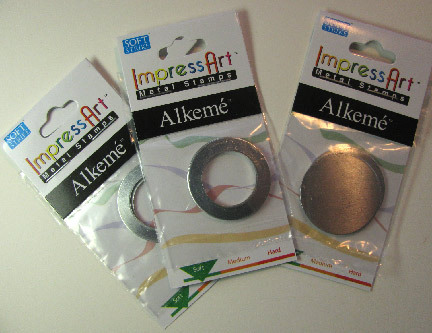 ImpressArt promises that with the softer surface comes deeper impressions and -- you're going to love this -- no tarnish! I can't wait to try these out and see what it's like to work with them. My packages came with blanks that don't have holes, so I'm sure that at least one of the circles will end up as a cabochon for a future bead embroidery project! Yay!